Like you I was sure that GoPro would kill the Fusion early on this year. Still it's to early to say if the new update will make it more competetive. In any case this beta release shows that a feature update was urgent. New beta update does not improve picture quality in any way. Tested today and there is significant improvement when using the GoPro mobile app. Before the stitch line was very visible when rendered using the mobile app and now it is virtually gone. Other than with objects very close, it is un-perceivable. Quality has also improved at the edges of the lens, so I'm happy with that. When I first tried importing, trimming, and saving files from Fusion with the mobile app it was not working. I could view media but saving would result in failed attempt messages. When I tried to trim my videos, it would appear to work, but nothing would be saved. Trying to grab a screen shot resulted in a blank black box. I deleted the app, restarted my phone and reinstalled. This time trimming and saving worked fine, but screen grabs still do not work. Instead of a black box, now I'm getting a bluish box with what appear to be the top and bottom meeting points of the lenses. Hard to explain, but regardless, it's not working when I try to grab a screen shot. As this is Beta, I expect there to be issues, but clearly GoPro is moving in the right direction and I could see significant improvement. Fusion has reigned as the top 360 camera for awhile now, only recently to be overtaken in reviews for the 360 One X. Mostly this has been due to a better mobile editing experience with minor improvements in quality which GoPro is clearly addressing. It's amazing at just how far ahead GoPro was at the start with Fusion and how it's only now that competitors are catching up. If GoPro can improve the mobile editing experience and clean up this update, they will be moving back into the #1 position again. As this is Beta firmware/software, is there another place or form where GoPro would like feedback posted? 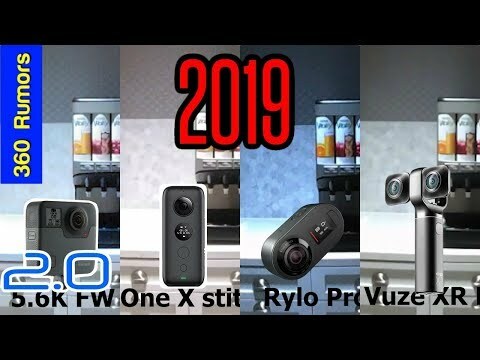 GoPro confirmed at CES earlier this month that a Fusion2 is coming this year. Clearly a upgraded to the picture quality needs more than a firmware update. While the date has not been given to the public, I would guess before the summer. The financial report scheduled for february 6 will probably give more details. I'm not sure what your point is in addressing me directly. Do you honestly think my assumption is that GoPro will not come out with newer cameras for the 360 market? Picture quality is already pretty awesome with Fusion, so I'm good for now. If anything, the next iteration of the the Fusion needs to address things like protective lenses and underwater recording. The image quality is great already. The Beta Firmware improves what is already great, and so the differences are not that apparent. However it is a noticable difference when using the mobile app. For me, I just want to see continued improvements on the editing side (mainly mobile). Since a new Model of the Fusion will only further this development, Fusion 2 is great news for those of us who currently own Fusion and for those considering purchasing it at the now reduced price. With the trade up, and knowing further development is continuing, the current Fusion is a worthy purchase. We great for me I can see the VR Plug-ins in After Effects but NOT in Premier 2019. After you install Fusion Studio (any version), remember to install the Adobe plug-ins from the links (see article here) to install the versions that support the 2019 versions of Premiere and After Effects. Thanks, Mariustanya - Yes I followed the instructions several times with no success. I deleted everything Adobe and GoPro and still no luck. I even created a new profile on my computer for a clean install. No luck. It works for After Effects though just not Premier 2019. I think it has something to do with Adobe not fully removing past versions of 2019 or 18 even though I select the option to remove preferences. I can make a youtube video capture if you will work with me to troubleshoot? Version 12 is working but kept the Firmware upgrade on the Fusion.